Audi A3 Interior, Sat Nav, Dashboard | What Car? 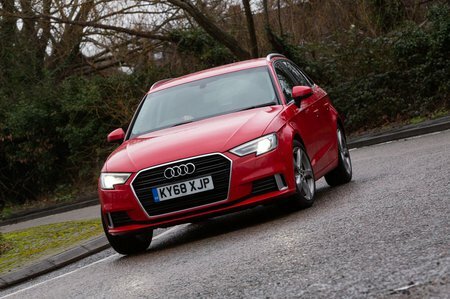 No one is likely to have trouble getting comfortable behind the wheel of the A3. The steering wheel has a wide range of adjustment and the seat can be adjusted for height. The seatback angle is altered via a wheel on the side, which makes precise adjustments easy, but it's disappointing that you have to pay extra for adjustable lumbar support across the range. Sport and S line editions have more supportive sports seats, with chunkier side bolsters to hold you in place better through the corners. Long-distance comfort is top-notch in all versions, though. The A3’s dashboard looks fairly sparse, but in a smart, minimalist way that also means it's wonderfully simple to use. Its instruments are legible and the major switches and dials – such as those for the climate controls – are distinctly labelled and easy to reach from the driver’s seat. The A3's slim front pillars and large side windows make it easy to see what's in front of you as well as what's approaching from the side. And, while the A3's rear pillars are on the broad side and obscure rear vision to a degree, they're nothing compared with those of many rivals, including the Mercedes A-Class. Rear parking sensors are standard across the range, while front parking sensors, a reversing camera and even a self-parking system are on the options list. SE Technik and Sport versions have relatively powerful xenon headlights. However, S line, S3 and RS3 models get even brighter LED headlights as standard. Most cars in this class have a touchscreen infotainment system, but these tend to be distracting to use while driving and force you to glance away from the road while attempting to hit that small, pixelated icon. The A3's big rotary-dial control that’s part of Audi’s MMI infotainment system is a better solution. Positioned between the front seats, you simply twist to scroll through the logically arranged and responsive on-screen menus and press down to make a selection. It's one of the best media systems in its class to operate, and only fractionally outdone by BMW’s latest iDrive set-up. The 7.0in display rises from the top of the dashboard when you switch the infotainment system on and slides out of sight when you power it down again. It's bright and easy to read, and the fact that it's so high up means you don't need to divert your eyes far from the road to look at it. 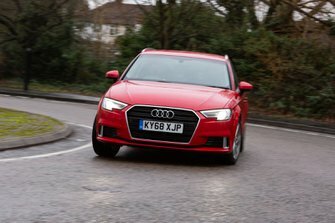 All versions of the A3 come with sat-nav, a DAB radio and Bluetooth, as well as Apple CarPlay and Android Auto smartphone mirroring. The optional Technology Package brings a built-in hard drive, live traffic updates and MMI Touch. The latter turns the top of the dial controller into a touchpad that you can use when selecting a destination or a phone contact, for example, by scrawling individual letters. The pack also adds Virtual Cockpit, which is a digital 12.3in display that replaces the standard analog instruments and places many of the infotainment's features, including sat-nav maps, media and phone lists, in view conveniently in front of the driver. The A3’s interior is the benchmark for how a family hatchback should look and feel, with everything built from the sort of high-grade materials you’d usually expect to find in an executive saloon. You’ll struggle to find unappealing plastics anywhere, even lower down the interior, while the materials directly in your line of sight are a real tactile treat, with classy metal flourishes that add to its seriously premium feel. You could argue that the A-Class adds more wow factor with its swish design, but it can't compete for robustness; everything in the A3 feels really well screwed together. What's more, the nicely damped switches and super-slick motion of the infotainment screen as it rises from the dashboard add to the impression that no expense has been spared.